For the delice, scoop out the flesh from eight passion fruit, place into a food processor and blend until the seeds become well pulped. Pour the juice through a fine sieve into a small saucepan, squeezing out as much of the liquid as possible. Discard the seeds. 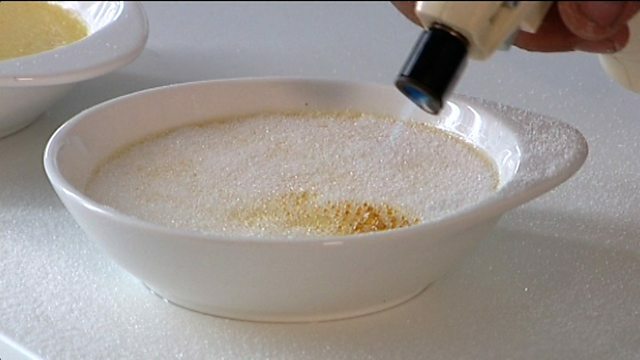 Add the double cream and two tablespoons of the caster sugar. Place over a medium heat and bring to the boil, then reduce the heat to simmer until the sugar has just melted. Place the egg yolks into a clean bowl and add the hot passion fruit mixture, whisking constantly. Return the passion fruit mixture to the saucepan and cook for one minute, or until just thickened. Add the soaked gelatine leaf and stir well to dissolve, then remove from the heat and allow to cool. 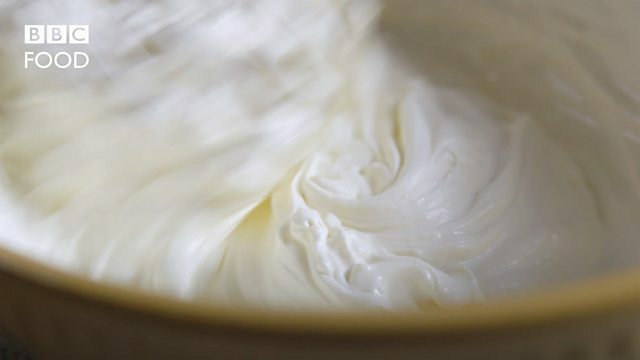 Meanwhile, in a separate clean bowl, whisk the egg white with the remaining tablespoon of sugar, until soft peaks form when the whisk is removed. Place the whipped cream into a clean bowl. Add the cooled passion fruit mixture and gently fold together to vreate a mousse. Add the beaten egg white and fold into the cream mixture. Cut six rounds from the sponge cake using six 7.5cm/3in chefs' rings, leaving the sponge at the bottom. Spoon in the mousse to fill each chefs' ring to just below the top, then place into the fridge to chill for 1-2 hours. For the topping, scoop out the flesh from four passion fruit and pour through a sieve into a small saucepan, squeezing out as much of the juice as possible. Add the caster sugar and water to the pan and place over a medium heat. Bring to the boil, then simmer until the sugar has dissolved. Add the gelatine leaf and stir to dissolve. Remove the pan from the heat and allow to cool. Remove the mousses from the fridge and carefully pour the passion fruit sauce over the top of the mousse, filling to the top of the rings. Return the rings to the fridge to cool for 30 minutes, or until the topping has set. For the satumas, scoop the flesh from three passion fruit into a clean bowl. Add the satsuma segments and orange liqueur and stir gently. To serve, place each delice into the centre of a plate. Use a mini-blowtorch to loosen the chefs' rings around the delice, then remove the ring. Spoon the satsumas around and serve.